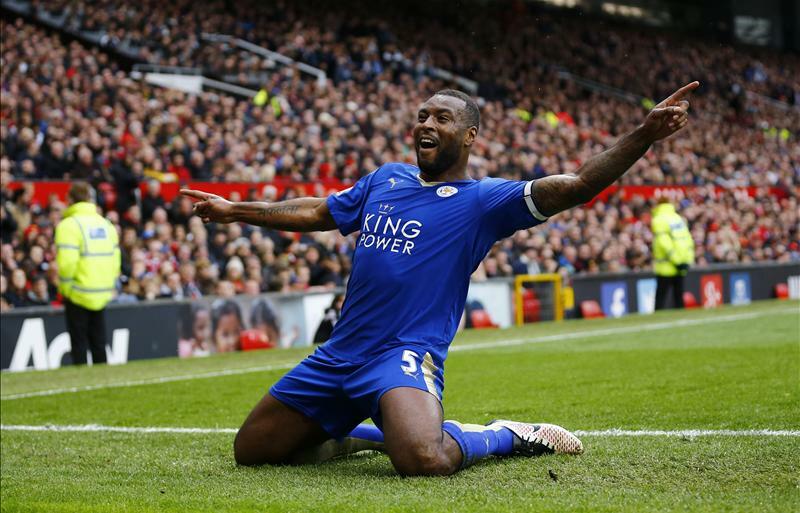 Wes Morgan cancelled out Anthony Martial's opener as 10-man Leicester City salvaged a draw and edged towards the Premier League title in a feisty clash against Manchester United at Old Trafford. The hosts instantly stifled Leicester's attacking force, and romped up their own source of pressure in the early stages. Crisp passing, slick movement seemingly puzzled the title-chasing visitors who required extensive concentration level in the tide of adversity. United had previously dropped themselves in a dire predicament of dominating matches, but failing to convert goals to show for it. They extinguished that bad habit, and took the lead in the 8th minute. Antonio Valencia received possession on the right against Fuchs, where he superbly dummied from the right, cut in to the left and pinged a looping cross over the box - which flew over Huth's tall frame and kindly landed to Martial who, albeit on a skiddy surface, showed immense composure to slot past Kasper Schmeichel from close range. The raw intensity of United's play showed glimpses of the glory days under Sir Alex Ferguson - the crowd fancied it too. Every promising piece of play provoked the home fans to stand off their seats in anticipation, and were almost rewarded to a second goal in the 14th minute. Having been pinned back in their own half for the large majority of the game, Drinkwater pinged a swinging free-kick into the area, where captain Wes Morgan arose highest to easily, perhaps too easily, thwart Marcos Rojo and steer a close-range header past De Gea in goal. Old Trafford's volume dropped to sheer silence as Ranieri's men re-announced intentions of securing the title on this very day. 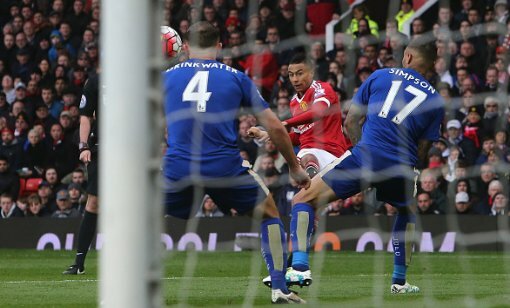 Moments later, however, Jesse Lingard forced an exquisite save from Schmeichel down low to his left, following a powerful piledriver from the edge of the area. In a game of unlimited and fierce action, Marouane Fellaini established himself in the bad books yet again with a controversial elbow on Robert Huth while angling for the ball in midair. The Belgian clocked his chin, and had it made contact with his nose, it would have surely broken it. As the minutes progressed, the match intensified. Fouls galore resulted in Rooney's free-kick taking a hefty block from the wall, while Riyad Mahrez was questionably denied a penalty when Marcos Rojo, who had played poor all half, stuck a leg out and seemingly blocked the winger. That was, of course, following Jesse Lingard's own appeal on Danny Simpson after the fullback rebuffed Lingard after he had a clear route through on goal. The Foxes went close to taking the lead themselves, as a delightful string of passing across the box culminated in Valencia recovering well to deflect Schlupp's solid effort out for a corner. From the result of it, Morgan once again left Marcos Rojo for dead - escaping his marker with ease but frustratingly planting his header over the crossbar. 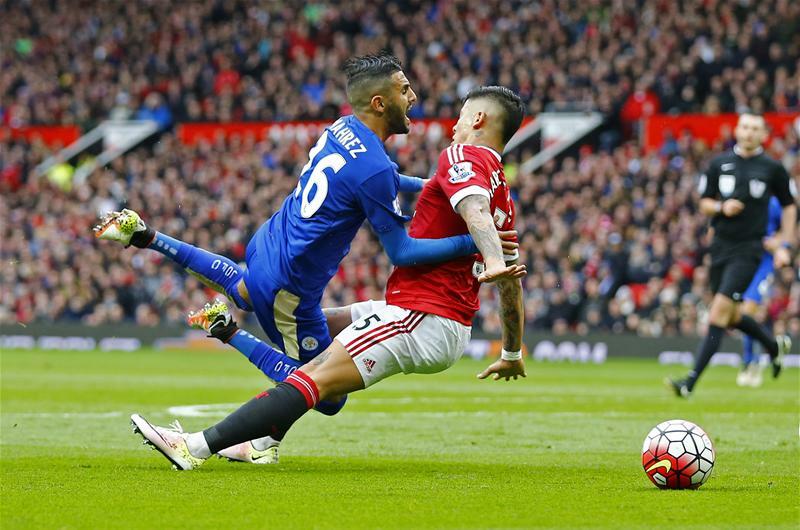 Leicester, despite showing immense grit to equalise, had still sustained a torrid half an hour on the backfoot. Strung on the end of rampant attacking, dazzling movement from the centre to the flanks from United - they also had their fair share of appeals, but Claudio Ranieri will have departed for the interval a satisfied man, especially after conceding first to Anthony Martial. In huge contrast to the first half, Leicester implemented a relentless attacking style in the early stages of the second stanza. Leonardo Ulloa's shot took a wide deflection, and two dangerous corners piqued the attention of United's defenders - especially Rojo - who yet again struggled to properly mark Wes Morgan. For the hosts, Rooney's attempted curling chip, almost Cantona-esque, floated over the crossbar and Louis van Gaal substituted Lingard in place for Juan Mata on the right wing. While the intensity died down substantially, neither team refused to back down from the other. It remained a positive, end-to-end game with Marcus Rashford's shot taking a solid block on the brink of the box, meanwhile Riyad Mahrez delightfully shuffled past an array of red shirts into the centre, however his stabbing strike was comfortably kept out by De Gea's gloves. 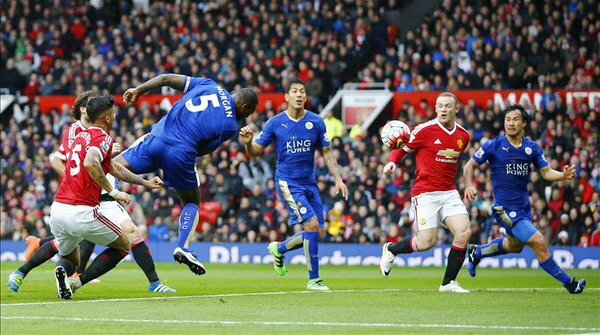 For a team so-called ambitiously hunting for the Top 4, United certainly weren't playing for it. They lacked urgency and cohesion in comparison to the first half - and Leicester were enjoying large spells of possession in midfield. And whenever they attacked, they put United under severe danger. As time progressed, the match became increasingly stretched and both sides committed to attacking purposes. United created pockets of space on the left avenue and fed the speedy, energetic Martial who blistered through resistant blue shirts onto the byline but his attempted shot bundled off Schmeichel and extinguished any danger once presented. With a jaded and fatigued Leicester side dropping back, United smelt blood and introduced Memphis Depay in place of Rashford. The youngster made his intentions known - making a scorching run down the left which ultimately left Leicester a man down with minutes remaining. Depay had initially shrugged off his marker, but Drinkwater received his second yellow of the game for evident shirt-tugging on the left side of the box. United appealed for a penalty, but referee Michael Oliver dismissed it and instead awarded a free-kick, in which Schmeichel bolstered his excellent performance by solidly palming away Rooney's cross, and then comfortably catching the United captain's strike beneath the crossbar. In two last ditch attempts to obtain victory, Kasper Schmeichel once again came to Leicester's aid to deny Rooney of possession on the edge of the box - with no support around him - and then feeding Albrighton a promising pocket of space down the right wing, which he used to full effect in a race against Rooney. He initially beat his man, but the pressure of two red shirts around him provoked a tangling of legs around the ball and it trickled out of play for a goal-kick. At the final whistle, the contest concluded 1-1. Title celebrations are on hold for Leicester, who strongly anticipate Tottenham's trip to Chelsea, where Pochettino's men find themselves in a must-win predicament. A draw is a loss in lesser terms for United, who remain four points adrift of fourth-placed Man City, albeit with a game in hand.